Yesterday, the Public Test Realm was closed. And today, Patch 2.3.2 goes live on US servers! 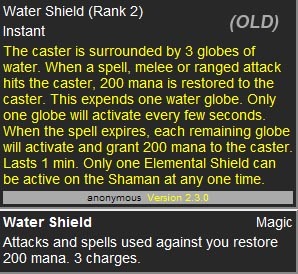 The Water Shield change is the most significant to us Shammieboxers. But before we get to the changes, lets review it's history. In the beginning, it was a 10min shield, that held 3 charges. Each time you got hit, you got some mana. Woot. Mind you, at the time it cost mana to cast. Shortly after that, it was upgraded. You would get nearly 200mana when hit, and it only lasted a minute. If at the end of the minute, you had any charges left, they each paid off at once. (ie if you never got hit, and the shield expired, you'd instantly get 600+ mana.) Bliz looked at what it had done and said, "This is mediocre." 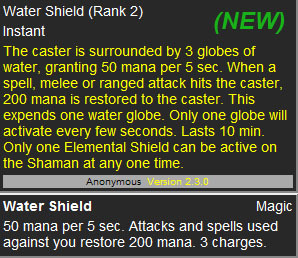 The bonus to mana was a welcomed change, but the need to refresh this shield every 60 seconds was quite frankly, rediculous. So in 2.3.2, we're getting a buff again, and I think they finally got it right. In the new version, we now get a buff that grants 50mp5 simply by having the shield up. PLUS, we still get 200 mana when we're hit, up to 3 times. PLUS, now the shield lasts 10 mins! So now, it becomes a 10 minute blessing that continues to make it easier for Shaman to maintain mana levels.